Our Specialist Contemporary Music program provides your child with opportunities to grow musically and personally in an environment that understands and supports musical creativity. We offer a dynamic, enriched curriculum that anchors theory in practice and extends your child to nurture their creative potential through the writing, arranging, recording and performing of their original compositions. We offer weekly instrumental lessons, class music lessons, participation in bands and ensembles, and access to digital recording facilities in the state-of-the-art, purpose-built Calvert Music Centre. 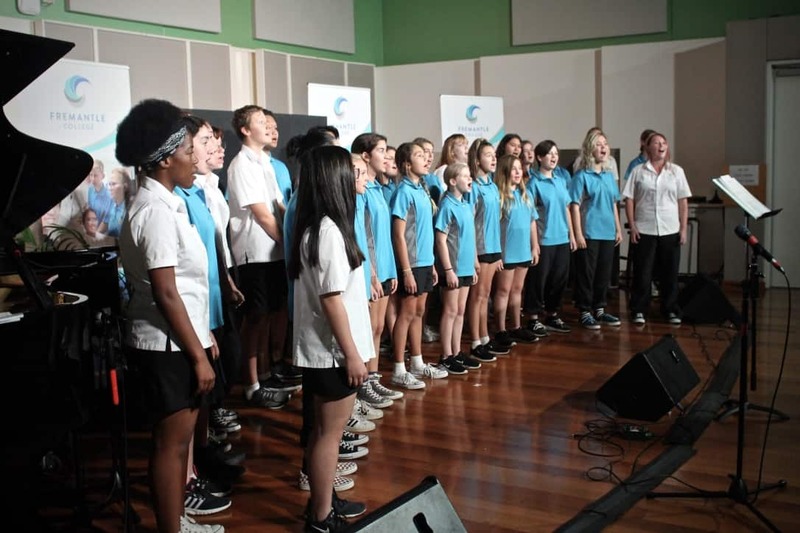 The first year of Fremantle College was very busy and exciting in Specialist Music, with our students immersed in a rich and innovative curriculum that challenged and developed all aspects of their musical knowledge, understanding and skills. In addition to the busy schedule of classes, rehearsals, recording sessions and performances, our students attended performances and workshops in our Visiting Artist Series including: The International Brass Quintet, Indian Classical Music expert Dr Sadanand Mankar, WA’s premier jazz orchestra the Oz Big Band and the Fremantle based band Superego. Our Lower school students also attended an open rehearsal by the West Australian Symphony Orchestra. Our Year 7 and 8 students attended an intensive rehearsal camp at Serpentine Camping Centre, taking part in photo shoots and workshops as part of a media project, team building activities and of course, lots of rehearsal and song writing sessions. Our musicians have participated in numerous performances including 12 family and friends showcases, an autumn concert, assemblies, concert pracs and more. The inaugural college Welcome Day when students performed on our Solar Stage as we welcomed people in to see our new school and all of the wonderful opportunities and facilities available to Fremantle College students. Our Vocal Group performed at the West Australia Government Schools Choral Festival and received the highest possible ‘Outstanding’ from the adjudicator. Term 3 Concert Prac with Dr Geoff Lowe and 17 Pre-Service Teachers from Edith Cowan University, all of whom were amazed at the standard of our musicians, the WAAPA rivalling, state of the art facilities in the Calvert Music Centre and the level of engagement of our Specialist Music Students throughout a rigorous day of performances and critiques. Movie Hits Extravaganza! With 110 Specialist Students, 139 Primary School Students (members of our Year 5 & 6 Instrumental Music School Services Program from 11 local schools), 17 bands, an orchestra, a choir, 3 TV cameras, our 5m screen and lots of energy, we presented two performances; a Schools Performance to 200 students from six local schools during the day and then the main event in the evening to a hall filled to standing room only, with more than 700 family, friends, community members and special guests. This truly was an epic day for the program! Our team of Specialist Music Teachers are very proud of how much our Music Students have achieved this year and especially the huge development and progress that has been evidenced not only in the improvements at each performance through the year but also student compositions, recordings, skills and theory tests and instrumental lessons. Find out more about our purpose built Calvert Music Centre. If your child is passionate about music, we invite them to apply for our Specialist Contemporary Music Program. Applicants will be required to participate in an audition/workshop, an interview and provide previous music reports.